Two hours integration time on this faint object is nowhere near enough. I hope this is the start of a good image, not the end of a fair one. The weather had other plans for me, so I have grown board of waiting and decided to post the image. 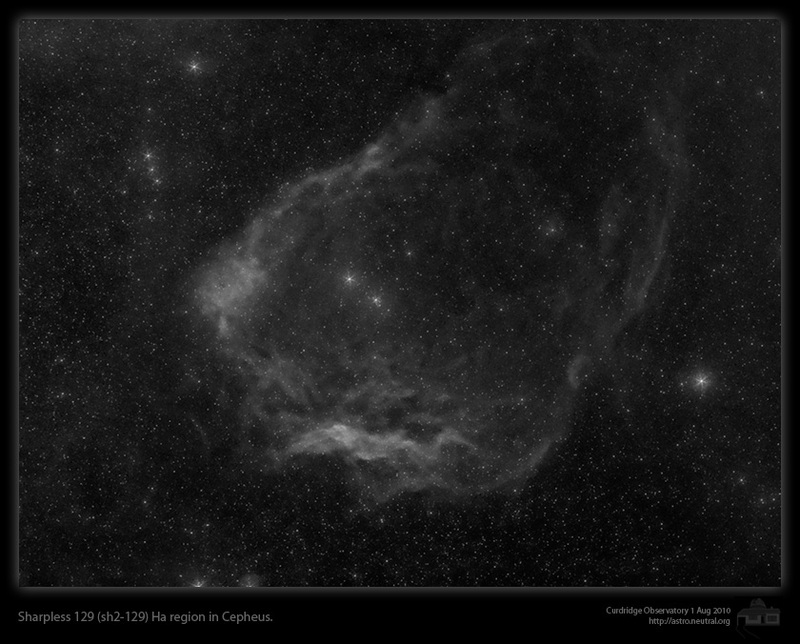 Sharpless 129 is a dim region which is often overlooked because it is next to the much brighter and more exciting IC 1396, which tends to draw most astrophotographers. I've torn myself away from the popular targets and gone for something a little less usual. Sh 129 is similar in size to IC1396 but much much fainter and more subtle. I quite like this region. It is a pleasing shape! :) I am hoping to double the integration on this object to about 4 hours, but I will have to wait for the weather to co-operate, and the moon is nearly back, so I might have to turn to brighter targets. I have read that the OIII and SII signal from this area is very small. Whilst I have taken the Ha image unbinned, I do not think getting OIII and SII unbinned is wise. I might try to SII in 2x2 binning mode. That way I can make reduce the Ha image down and make a smaller colour image, whilst presenting the higher resolution Ha data as a separate image.